Are you looking for an Air Fryer chicken recipe? I LOVE my air fryer! 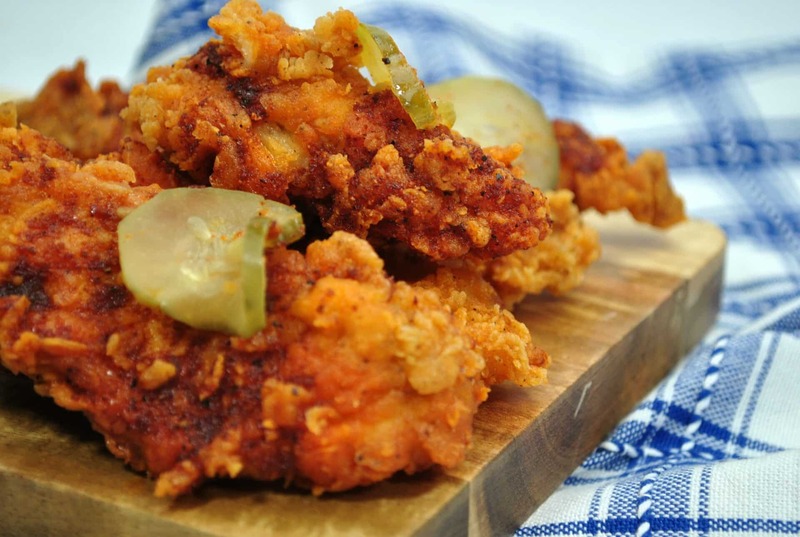 This Nashville Chicken recipe takes home the cake. Delicious spices topped off with tangy pickles gives you just the right amount of the heat and crunch. This recipe is the perfect homestyle meal for the weekend. If you make it, please invite me over. No, seriously. Doesn’t a meal always taste better when someone else makes it for you? LOL! I always tell my husband that but he never steps up to the stove. UGH. We live in such a fast-paced society… but nothing beats a homestyle meal, right? Yummy goodness in every bite! Here’s how you can replicate this recipe at home TODAY. You need a few hours to work this magic! Be warned!! This is not a quick meal that you can throw together right after you come home from work. Either make the marinade the day before of anticipate making this recipe over the weekend. While the Air Fryer makes the cooking process speed up, you still need to marinade! Are you ready to get this party started? In a large bowl, toss together the chicken, salt, black pepper, 1 tablespoon hot sauce, 1 tablespoon of pickle juice until well combined. Cover with plastic wrap and refrigerate for at least 3 hours. Pour the flour into a bowl. Whisk the eggs, buttermilk, and a tablespoon of hot sauce in a separate bowl. To dredge the chicken, place it in the flour toss each piece to evenly coat. Then place it into the buttermilk mixture, and then back into the flour. Place the breaded chicken on a baking sheet in a single layer. Continue to finish the other tenders. Set your Air Fryer to the chicken setting or 380 degrees. 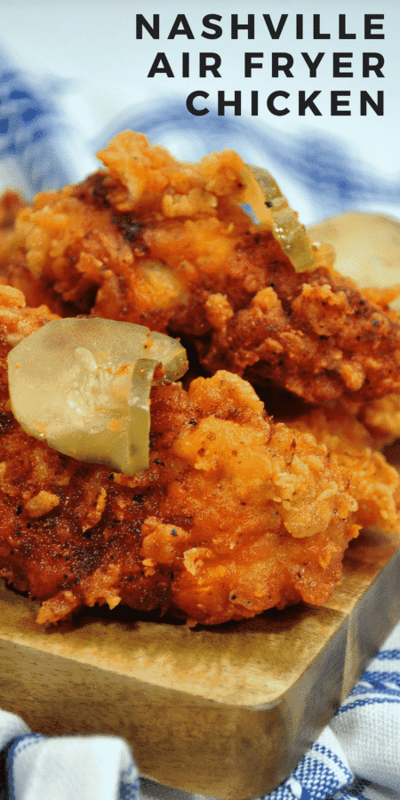 Place your tenders in the Air Fryer dish in a single layer. Cook for 10-12 minutes or as your Air Fryer sets on its chicken settings. Continue to cook all of the tenders. To make the hot spicy sauce, whisk together the spices, brown sugar, and 1 cup of olive oil until evenly combined. Immediately pour it over the fried chicken tenders. Serve with pickles. Enjoy! 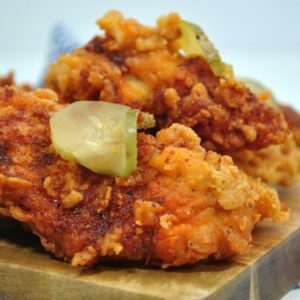 What do you think of this Air Fryer chicken recipe? Something you’d like to try out? Do you have another one that’d you like to share? For more recipes, be sure to visit my food section. You need to take the time to let your chicken air dry while processing. It actually matters. If you like some heat, be sure to add the spice. Don’t be afraid to add it in! 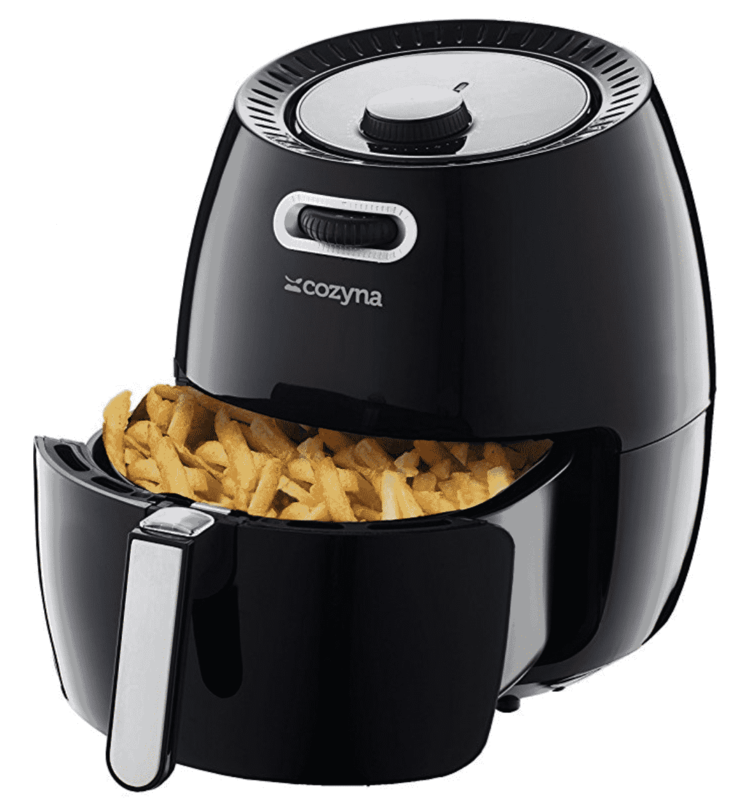 Also – if you haven’t purchased an Air Fryer yet… check out this one. It is HIGHLY rated!! So many 5 star reviews!! 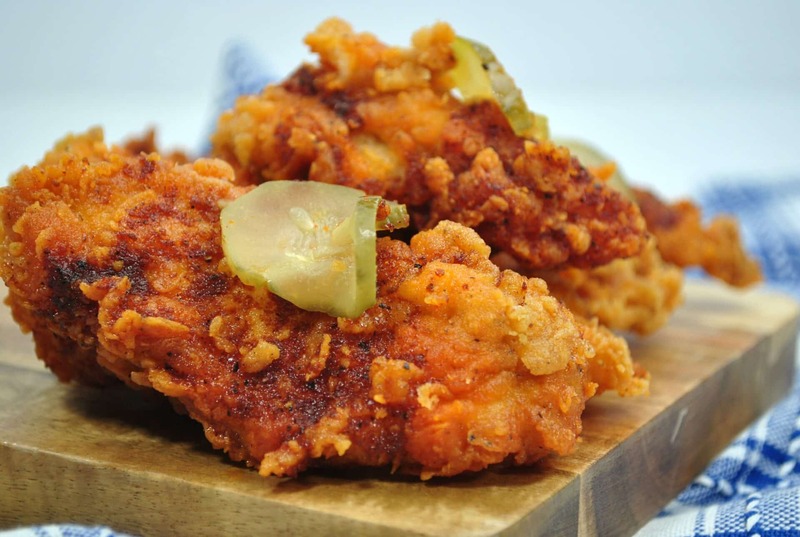 Do you have a special Air Fryer fried chicken recipe that you’d like to share? Link it below. I am always up for a new one to try. * In a large bowl, toss together the chicken, salt, black pepper, 1 tablespoon hot sauce, 1 tablespoon of pickle juice until well combined. * Cover with plastic wrap and refrigerate for at least 3 hours. * Pour the flour into a bowl. * Whisk the eggs, buttermilk, and a tablespoon of hot sauce in a separate bowl. * To dredge the chicken, place it in the flour toss each piece to evenly coat. Then place it into the buttermilk mixture, and then back into the flour. * Place the breaded chicken on a baking sheet in a single layer. Continue to finish the other tenders. * Let air dry for 10 minutes. * Place your tenders in the Air Fryer dish in a single layer. * Cook for 10-12 minutes or as your Air Fryer sets on its chicken settings. * Continue to cook all of the tenders. * To make the hot spicy sauce, whisk together the spices, brown sugar, and 1 cup of olive oil until evenly combined. * Immediately pour it over the fried chicken tenders.